Mary Katrantzou had a career redefining moment a few years ago when she defied all expectations and removed digital printing from her collection, focusing solely on surface detail, tailoring. Flash forward to 2017 and she’s established equilibrium, with tailoring and surface decoration counterbalancing printing. The facets work symbiotically, creating a richer experience with emphasis placed equally on tactility as on aesthetics. She was looking at the 1940 animated film Fantasia. The animated film arrived at the beginning of a decade Katrantzou revisits time and time again. Her analysation of wartime and post-war fashion enraptured the audience at the Tate Modern in February, with the Royal Philharmonic Orchestra playing live to accompany the models’ stride. A veiled subtext, Fantasia is a surreal cartoon and differs from the world we live in; over the past twelve months designers have been exploring what surreality means and how it pertains to the current state of affairs—truly, there are recognisable intersections. 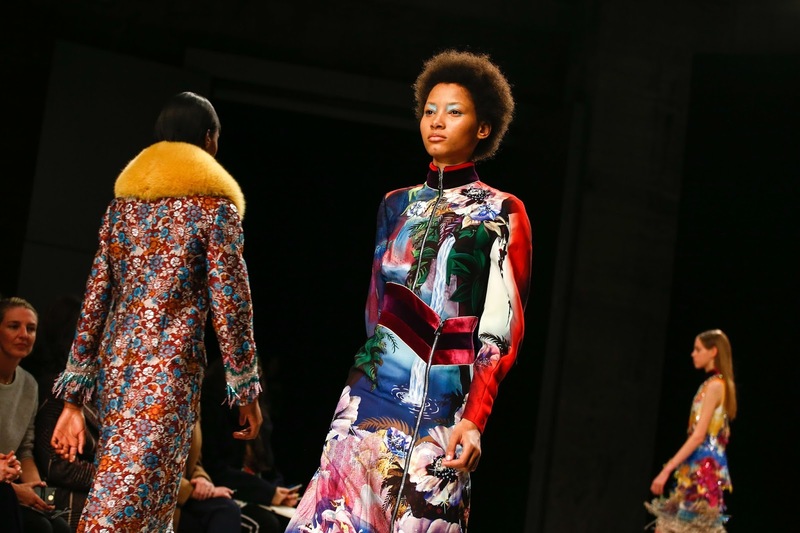 Katrantzou’s presentation wasn’t preoccupied by the political turmoil and uncertainty but rather subtly nodding to the fact that the world we live in isn’t concerned with reality. 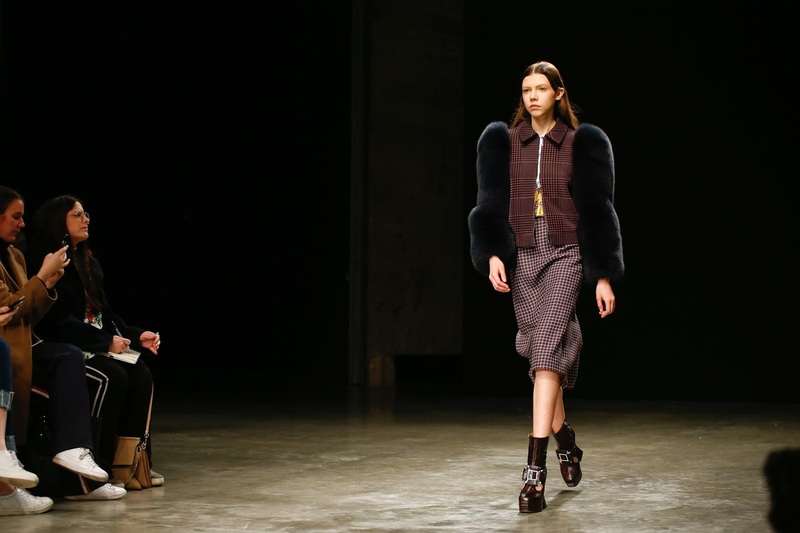 Enormous fur stoles encase the necks of models; prints work counterintuitively with odd pairings. The eyes adjust to the feast quickly, savouring the finer details: the jewel embroideries on coats, the swan embellishments. Whiffs of Prada were unmistakable, yet forgivable. Her work has long referenced the Italian great. However, there are now Katrantzou-isms which punctuated her oeuvre: the thick fur sleeves on jackets, the invested interest in faux fur, the micro-mini dress with fabulous embroidery or delightful prints, a pleated tulle skirt that emerged in the Fall 2015 show. 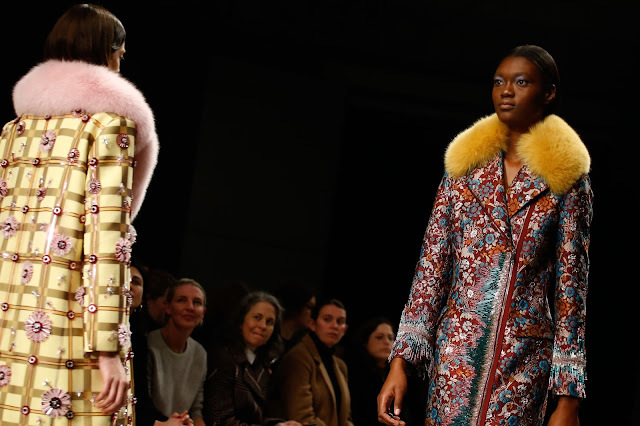 The Prada references this season were stronger than in the past, undeniably and one wonders why. Katrantzou is a talented young woman who carved a place for herself on the London schedule with aplomb, experimenting with colour, texture and tailoring. She’s weathered criticism and received laudatory praise, the latter deriving from the more instinctive, original outings. Perhaps self-doubt set in? 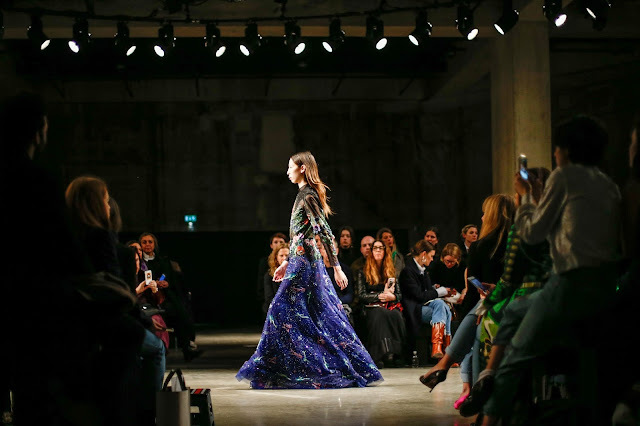 The possibility of self-doubt aside, if Katrantzou’s aim was balance, poise, she certainly achieved it. Her latest womenswear offering is characterised by a maturity that many other London designers lack. 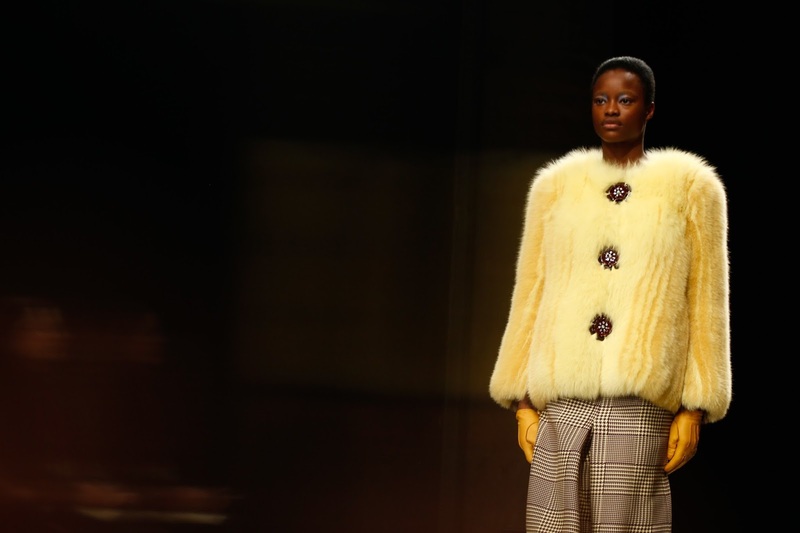 Sure, her collections have a youthful verve to them—one cannot ignore the nods to Disney’s Fantasia here—but the levels of sophistication found her were amped up. 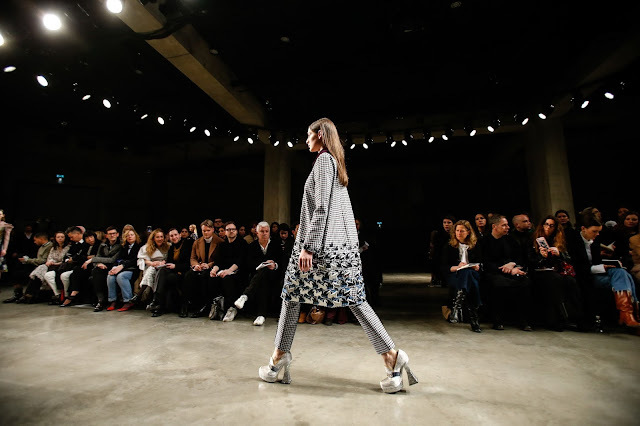 London designers are growing up and Mary Katrantzou’s label has blossomed.